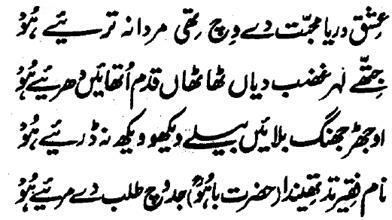 Hazrat Sultan Bahu Rahmatu-Allahe Ta-aala Alaihe says that 'that person, who claims Ishq, he should swim into the river of Ishq and Muhabbat like a real man and should enter that part of this river, where awfully dangerous waves and lashes are. He should not fear from those parts where he finds forests full of blights. Calling himself Faqeer by the Seeker fits only then when he has (virtually) died prior to his (real) death.